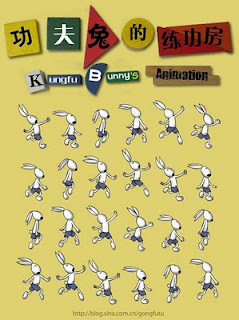 Allen Varney, a fellow University of Nevada graduate, recently tweeted about an amateur animation series called Kung Fu Bunny. In particular, he provided a link to the series creator's YouTube posting of the third episode of the series. This particular video has been online for about a month and the two older episodes were posted in 2007. Near as I can tell, these videos were posted by an animator who identifies himself merely as "Vincent." If I could read Chinese characters, I would be able to provide a translation of his printed name. Alas, this is not the case. You can visit his personal blog at http://blog.sina.com.cn/gongfutu. The animation in the third episode of the series is seemlessly integrated into live action footage with remarkable effect. It's amazing how technological innovations have made it so that an amateur animator can integrated live action and animation in a way that makes Who Framed Roger Rabbit? look primitive in comparison. Certainly, some of Vincent's coloring technique, particularly the shading of the characters, was influenced by the Disney film, but the work here is excellent. An added bonus to the video is that the narrative is wonderfully entertaining. American audiences will be familiar with the narrative tropes being used in the story as they are the time tested tropes of the Warner Bros. Bugs Bunny cartoons, Tom and Jerry, and Kid vs. Kat. In this case, our narrator wants to catch the mischievous Kung Fu Bunny and sets a trap. When this trap is evaded, and our animator mocked, he sends his trusty animated dog companion after the Bunny. The rest is comic gold.